Nearly a decade ago when I was newly settled into private practice in Memphis, a drug representative for a new and powerful antibiotic stood in my office and asked whether I would like to attend a consultants’ meeting about the drug in Washington. He said I was a “thought leader” in the field and had been selected for his company’s speakers bureau. Flattered, I agreed, if my wife had no conflict with her on-call schedule. The pharmaceutical company would pay for my flight, a two-day stay at the Ritz-Carlton, meals and $750 honorarium. It was an attractive invitation since my in-laws lived in Sterling, and a family trip was overdue. The drug rep told me, though, that his company would not be able to pay for my wife’s and kids’ flights. She could be a consultant, too, he said. The company would pay for her flight and give her an honorarium, and “then you can have two rooms at the Ritz and invite your in-laws!” When I pointed out that, unlike me, she was not an infectious-disease doctor and had little cause to prescribe an antibiotic of this kind, he replied, “That’s okay. I will talk with my manager.” Sure enough, we received two flights and two rooms at the Ritz. The relationship between doctor and drug industry has long been a cozy one. By offering up such perks as a trip to Washington, drug reps have easy access to physician’s offices and can influence what doctors prescribe. But things are changing. Under pressure, PhRMA, the pharmaceutical industry trade group, published rules in 2002 prohibiting drug reps from giving doctors lavish trips and tickets to entertainment events. Meals and speaking fees were not banned. 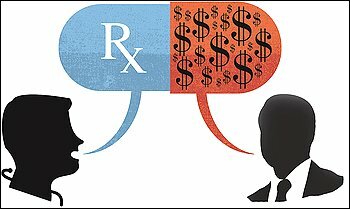 Two weeks ago, the nonprofit investigative news organization ProPublica published onlinethe names of 17,000 doctors who together received $250 million since 2009 for speaking engagements and consultations from seven leading drug companies. Looking through the list, I saw names of many friends and mentors. Two of the three doctors who got the most money – more than $250,000 each – work near me. I have mixed feelings about my profession’s relationship with pharmaceutical companies. I must admit something gnawed at me during my stay at the Ritz. The consultants’ meeting turned out to be a group of 25 doctors being led through a slide presentation on the benefits of the drug, which belongs to a class of antibiotics called fluoroquinolones. I realized that I was not in the company of “thought leaders” but rather in a group of ordinary doctors who, like me, wanted a fun free weekend in Washington. I tried to convince myself that the trip and other perks I’d gotten, such as free tickets to basketball games, did not influence my prescribing practices, even if these gifts might influence other doctors. A 2000 study in the Journal of the American Medical Association found that the more gifts doctors received, the less likely they were to think that their prescribing behavior was being influenced. Talks given by speakers paid by a drug company can serve a valuable purpose. I learn about new drugs that can save patient lives. I also can discuss treatment options with other physicians, which I rarely have the opportunity to do. But while I can justify paying doctors for speaking to their colleagues about a drug, I have an uncomfortable feeling about my frequent encounters with drug representatives. According to a 2004 review in the New England Journal of Medicine, the pharmaceutical industry spent nearly a third of its revenue on marketing in 2002, or about $8,000 to $15,000 per physician, through a sales force that numbered nearly 90,000. The study also mentioned that doctors received an average of four visits per month from drug reps. Meanwhile, studies have shown that after these visits, doctors are more likely to prescribe a particular drug and request having the drug added to the formulary at their hospital. Why is this the case? A drug representative humanizes a product and often explains it in a way that makes it sound good. Also, even if no gifts are given, I feel obliged for the courteous visit. And the cost of a drug often seems irrelevant if a third party, such as an insurance company, is paying. In the end, if the drug sounds like it might help a patient, I tend to prescribe it. For a second, I felt a little guilty about not ordering his product. But then I felt violated and manipulated. I asked him to leave my office and not come back. That afternoon I told my secretary to cancel all appointments with drug reps and not to schedule any more. I am not alone in thinking this way. Columbia University researchers who studied the issue of conflict of interest between marketing and patient care concluded in 2007 that “only the prohibition of [doctor-rep] interactions will be effective” in reducing it. My decision came with a price. I no longer have access to the free sample medications that I once gave to my low-income patients. Also, I am not updated as I had been on new medications or talks sponsored by drug companies. A year ago, when a pulmonologist asked me about a new copycat antifungal medication, I felt embarrassed. I knew little about the drug. A drug rep had visited him and not me. With thousands of journal articles published each year, and with new drugs and new indications for old drugs regularly being approved by the Food and Drug Administration, it’s impossible for a busy practitioner to keep up. Doctors often rely on drug reps to filter information, which can pose its own problems. Take the case of Vioxx, the painkiller made by Merck. In 2001, a study in the New England Journal of Medicine showed that patients on Vioxx were more likely to have a heart attack than those taking a generic pain medicine. According to a commentary in Slate, drug reps continued to market Vioxx and doctors continued to prescribe it until Merck voluntarily pulled it from the market in 2004. The American Medical Student Association developed a “PharmFree” campaign to encourage students not to rely on drug reps for education and to work to limit drug reps’ access to campuses. AMSA also developed a scorecard – it can be found atwww.amsascorecard.org – grading medical schools on how well they limit the access of pharmaceutical companies and drug reps on their campuses. The drug industry’s relationship with doctors needs transparency, regulation, enforcement and professionalism. Transparency can be achieved by such measures as ProPublica’s list and the AMSA scorecard. Under the health-care overhaul, a government Web site will list all doctors who take money from a pharmaceutical company beginning in 2013. We also need regulations and enforcement to bar doctors from taking excessive and inappropriate gifts and speaker fees. Lastly, doctors need to seek inner guidance from their sense of professionalism. No matter the source of undue pressure – the pharmaceutical industry, insurance companies or the government – physicians need to remain true to the best interests of their patients.